Told you I'd be more on the ball now. We're 2 for 2! Ultimately, ending up at Disneyland wasn't really surprising. I feel like even though we're getting older, my cousin Gina and I aren't really growing up. 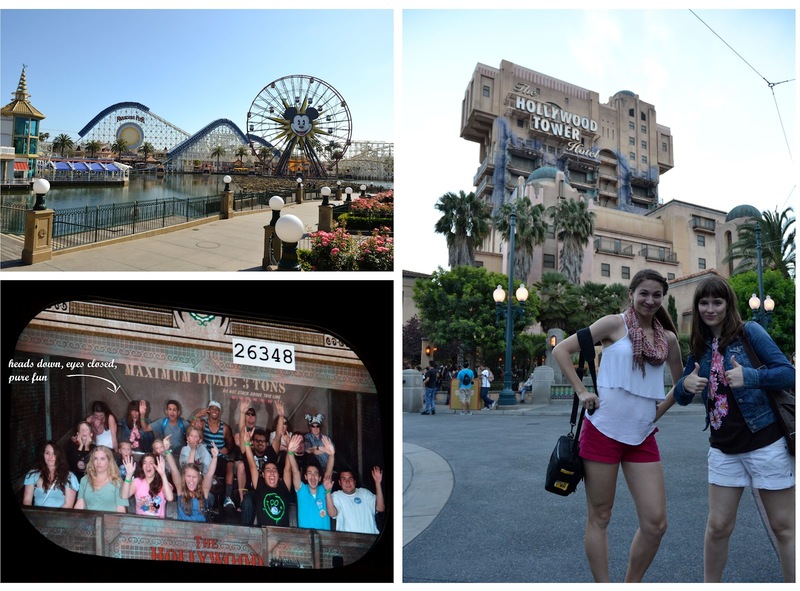 My first day in Cali we headed to the theme park and scared ourselves silly on the Tower of Terror; Gina's first time. You can just barely see our reaction to the ride! I am aiming to be as good a hostess to any Belgian trip takers as Gina was to me during my stay with her. We didn't stop for a moment and we also ate at the most amazing places. This little place was called The Griddle. 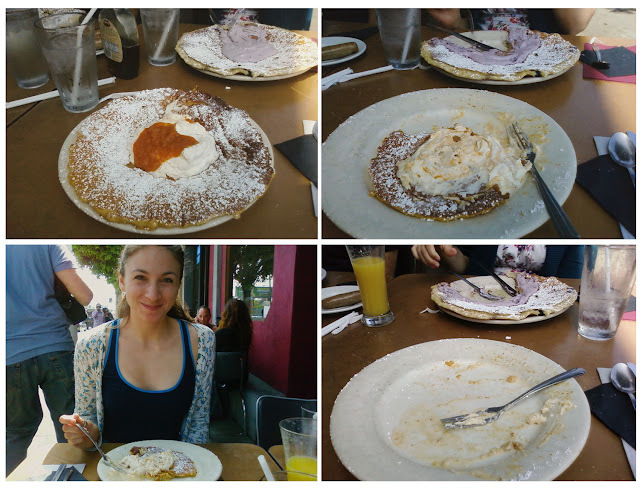 Frequented by celebrities and consistently packed wall to wall, our breakfast's standard was set high. And it did not disappoint. I completely finished my gigantic helping of "Tis the Season" a pumpkin flavored pancake topped with homemade whipped cream, powdered sugar and a little more pumpkin filling...Christmas in my mouth! Must replicate. I should note that Gina's boyfriend Dave made a comment when I was three bites from the end that he has never seen anyone finish their serving before...whoops. Side note: We DID see a celebrity while there, Simon Pegg! If you haven't seen him in anything, Hot Fuzz is a pretty stellar movie, albeit a little violent. A little more California for you: here's the family in Temecula. 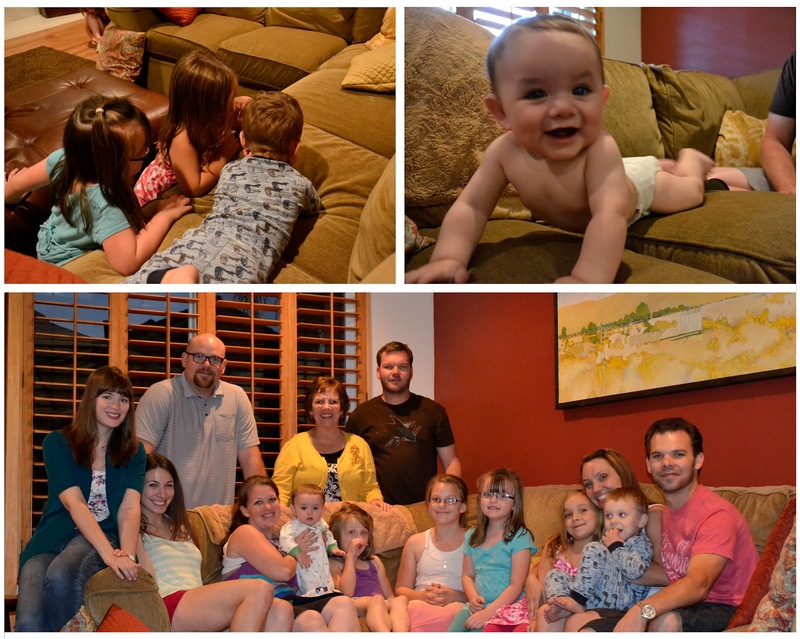 I haven't seen some of these cousins since their birth, (okay, only some of the 2nd cousins), but it had been waaaay too long. So thrilled to see them all! And last but definitely not least, I finally got to see Megan at her college in Spokane. 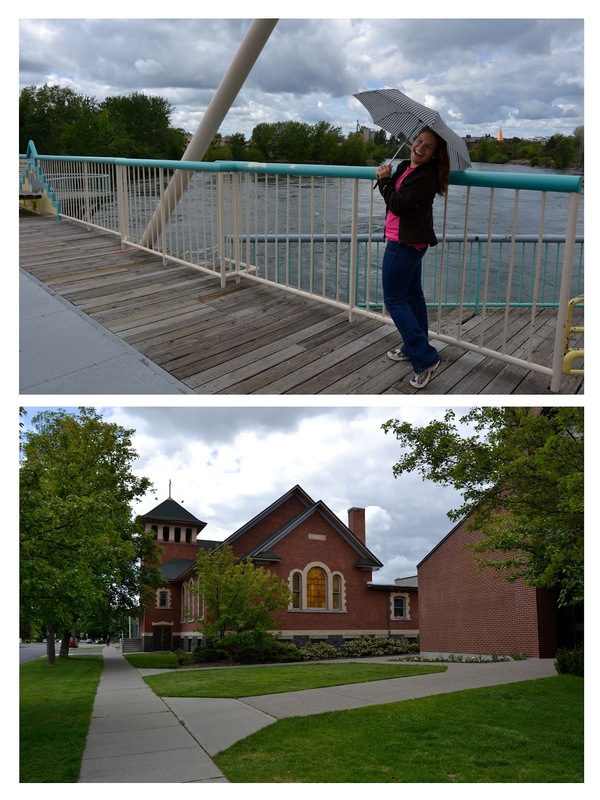 The weather was actually better than I'd expected from the northeast, but we brought umbrellas just in case! And mainly what we did was eat. Honestly. So far here in Belgium all I've found that I can figure out what it is to eat has been bread, cheese (and who knows what kind it was), strawberries and the Magnum chocolate ice cream bars. It'd be nice to eat somewhere new where I had someone to show me the ropes again! But, I digress. Megan and I ate assembly-line sushi, my first experience, mmm. Then headed to Donut Parade which apparently is a big deal. The place was packed. 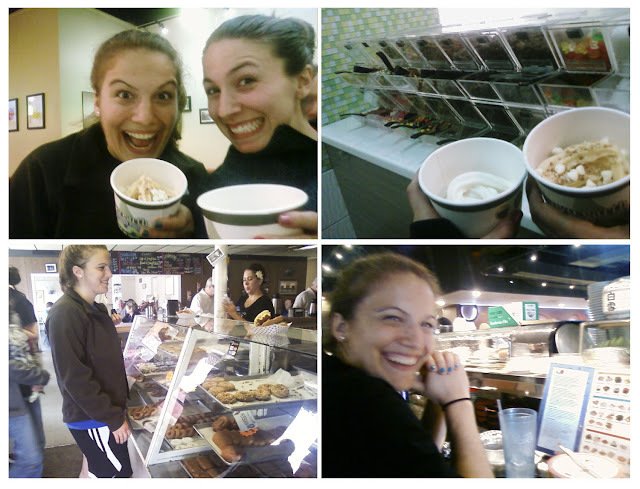 And again, definitely not least (we went twice in two days) was Froyo Earth. It's like Coldstone but with frozen yogurt and make-you-own style. LETS GO BACK. Tomorrow I may bring back a little bit of Belgium to keep some attention out there. I'm headed out to shop on my own for the first time. Chris told me about a second hand shop where I might find art supplies and more...should he have added the "and more"? I'm thinking no, but I'll try to keep the euros in my pocket! Yay Kelly!! I am loving these blog posts (especially since I'm featured in this one ;P ) Can't wait to hear more about Belgium!! You gotta branch out a little on the food though. Remember how much you liked goat cheese when I made you try it?? Just imagine, maybe you have lots of favorite foods out there that you haven't even tried yet! Wellllll last night we tried Moroccan. BIG jump from the norm for me. And it was okay. Not a new favorite but I could probably survive on their couscous kip (chicken in dutch?). But their mint tea?? Delicious! I could definitely survive on that.